Light: Putting old things together in new and exciting ways. Coming up with unexpected solutions. Using your experience to solve puzzles and problems. Doing what you set out to do. Directing the efforts of others. Shadow: Using your creativity to get out of honest work. Investing great energy in avoiding responsibility. Boasting about achievements without putting your expertise to practical use. Lording it over others. Personality: The King of Wands can represent anyone who wants to oversee or take control of (King) a situation (Wands), especially in academic, romantic, and professional areas of life. The King may also represent the tendency to be more authoritative than cooperative or the need to control the actions of others. Story: Surrounded by indecision, the Main Character takes control and gives orders. Relationships. When it comes to your own relationships, you’re in the driver’s seat. What do you want? Are you getting it? If not, why not? While relationships are a two-way street, you ultimately decide whether or not you will continue to be involved. It could be time to lay down the law. Work. Someone in authority needs to be calling the shots. There is a need for input from an experienced worker who has been empowered to cut through red tape and make things happen. If you’re that person, step up. If you’re not that person, step aside. Spirituality. Who’s in control? We like to think we hold the reins of our lives, but all too often, the Universe reminds us that we are a very small cog in a very large machine. Consider today the role you play in larger plans, and make yourself available to be a means for accomplishing great things. Personal Growth. In order to achieve your goals, you must control what you can: your habits, your choices, your schedule. Without being rigid, you can put a structure in place that takes the craziness out of the most hectic days. That foundation will help you maintain the calmness of a King, even when the castle walls are falling down around you. Fortune Telling. This card represents an older man with a commanding, charismatic personality, likely born between November 13th and December 12th, who prefers to give directions and have them followed. When? Between November 13th and December 12th. The Lion and Salamander. The Lion, often seen on the throne of RWS-inspired versions of this card, has long been a symbol of royalty. The lowly salamander was once thought to be born in fire and capable of passing through flame without injury. In your situation, who is trying to appear impervious to attack? Why? The Posture of Authority. 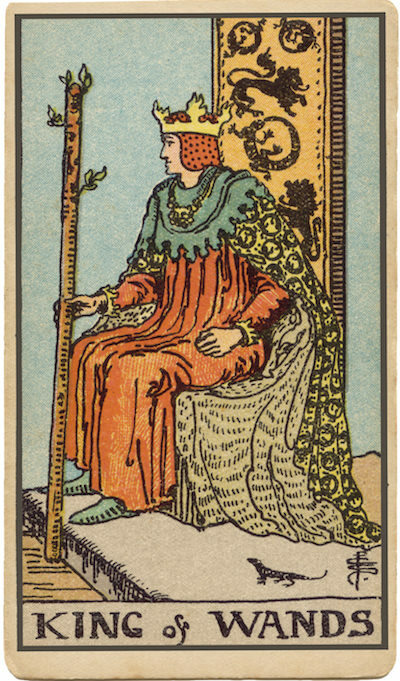 The posture of the King of Wands is generally relaxed, but authoritative. He often sits with legs apart, suggesting sexual dominance. There’s a lesson here: half of being confident is acting confident. Power vs. Preparedness. Many are eager for power and authority, but few are prepared to accept the consequences of absolute power. Are you? The Marseilles Image. The Marseilles King of Wands looks positively splendid with his wide-brimmed crown, epaulets, and gleaming armor. He is the picture of confident command. His demeanor may hold the key to your situation. What would happen if you were to lead while clearly expecting others to follow? How confident a leader am I? How can I project more confidence? How can I offer my expertise in ways that inspire others to follow me?